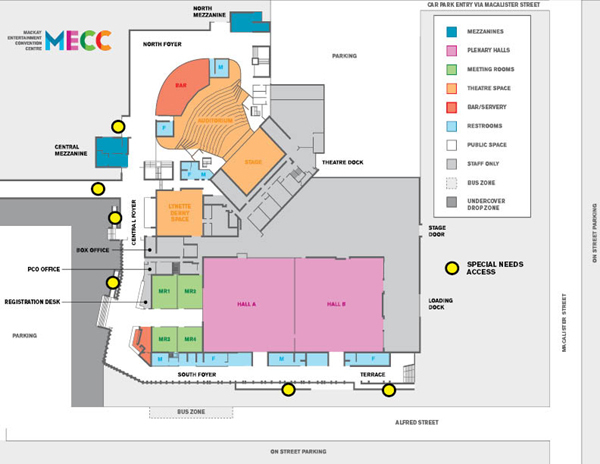 The MECC has three exit/entry points - north, south and central. North Foyer, Auditorium, Box Office, Civic Lawn. Access to the MECC to load and unload is via Alfred Street. Simply turn north off Alfred Street into Macalister Street and reverse park onto the loading dock. Articulated vehicles will need to provide notice of acquiring access so that restricted street parking can be made limited for easy access. Please contact our Production Services Coordinator on 07 4961 9715 prior to arrange. The centre has two designated drop off zones located in Alfred Street. Please refer to the map for further detail. Two designated disabled parking zones are provided directly on Alfred St. Additional disabled parking is also available on surrounding streets. Box Office for more information on disabled seating. We also have specifically designed lift to assist delegates to a stage for conferencing where required.